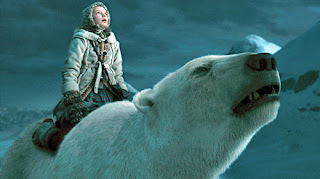 I keep reading that the movie The Golden Compass suppresses the anti-religious message in Phillip Pullman's books, but the movie has plenty of punch, besides being full of stunning imagery and good acting. I thought it was great (and now I need to read the books). A moviegoer could come away thinking Pullman is for witches and demons and multipe universes, talking polar bears and mysterious dust. The movie's real theme, though, is truth. i have a comment struggling around in my brain about anthropomorphism and the nature of polar bears, but I am too stupid to arrange it properly......so I'll just say that the mulefas are the best bit, you will like them when you get to them. My wife and I saw the movie two days ago. I got the impression the Magisterium was just the embodiment of authority in general. I haven't read the books either though, so I could be wrong. What Becomes a Monday Most?